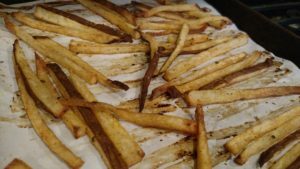 Do you have a favorite fast food french fry? One that when you think about it you can pretty much imagine what it tastes like? I feel that way about In-and-Out French Fries. I know, I know, most of you are probably rolling your eyes right about now. What is so special about In-and-Out French Fries? Maybe because they are cut fresh and fried in 100% vegetable oil? I have some other favorite french fries that make my list. The next, unfortunately, don’t exist anymore. For those of you who went to college with me remember a little drive-in just down the street from the dorm, called Leo’s Campus Drive-In. They served what they called “the pounder” with fry sauce. We used to go down there for a study break and get milkshakes and share “the pounder”. When I think back, they weren’t anything super special, just your run of the mill crinkle fries. Maybe it was the sauce we dipped them in or just the sprinkle of salt. My next favorite fries have to be the Gordon Biersch Garlic Fries at the Raley Field in West Sacramento. I think there is absolutely nothing like sitting at a ballpark on a warm summer afternoon eating a hotdog and garlic fries and watching a baseball game. I’ve had garlic fries at other venues, but for some reason, I think ones at the Raley Field are the best. Recently I got tired of making store bought fries to go with our dinner. I don’t deep fry them, so I was looking for something that would make good, crispy fries without the fat of the fryer. I found a recipe online and adjusted it to what you see below. Wash the potatoes (peel if you prefer). Cut the potatoes into thin slices about 1/4 inch wide. 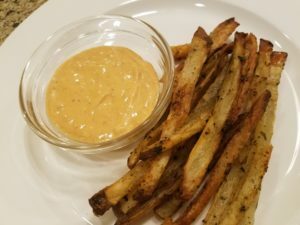 This dipping sauce would be fantastic on hamburgers or a dipping sauce for homemade chicken fingers. This entry was posted in Potatoes, Side dish, Vegetarian.